Melissa Riba is the research and evaluation director for CHRT. In this role, she directs CHRT’s survey and program evaluation portfolios. This includes CHRT’s two biennial surveys—Cover Michigan and the Michigan Physician Survey—and numerous evaluations for community and statewide programs aimed at improving health and health care for Michiganders. Melissa previously was a senior consultant for evaluation and survey research in the Health and Human Services Policy Division at Public Sector Consultants, Inc. In this role, Melissa designed and conducted research that evaluated federal and state funded programs related to expanding access to care for the uninsured, children’s mental health, special education, and the use of substance abuse services among the Medicaid population in mid- and southern Michigan. 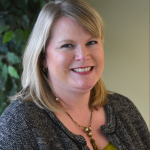 Melissa holds a Masters in Sociology with an emphasis on medical sociology and research methods from Michigan State University.